As technology to collect, process, and analyze medical information transforms healthcare, mobile devices will play a central role. Many of these mobile devices originated from consumer technologies and they were not designed to support enterprise standards for security. 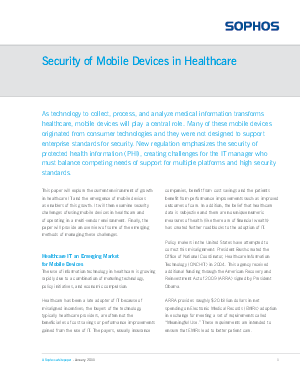 New regulation emphasizes the security of protected health information (PHI), creating challenges for the IT manager who must balance competing needs of support for multiple platforms and high security standards.